May | 2014 | What Next? Don’t Be A Wine Snob! “Don’t be a wine snob!” That was the first piece of advice we received from our zany guide Robert Bevan who we met on a trip to New Zealand. He led a wine tour we joined in Hawkes Bay, on the east coast of the north island. Robert, a former PGA golf caddie, grew up in British Columbia, Canada. He decided to live in New Zealand after holidaying there and falling in love with the country’s golf courses and wines. Robert was funny, enthusiastic and incredibly knowledgeable about wine. Robert said wine is like art, poetry or music. Everyone has individual tastes and personal preferences. What one person thinks is a great wine another person might not like at all. Only ‘wine snobs’ think they can choose the ‘best’ wines. Despite his warning about wine snobbery, Robert unabashedly praised New Zealand wines. He claimed they ranked third in the world after wines from California’s Napa Valley and the Bordeaux region of France. It was French missionaries who introduced wine to New Zealand. The Pope sent a group of priests there in 1842 to covert the Maori people to Christianity. The holy fathers knew they’d need communion wine so they brought along their own vintner. He carried cuttings from the best French vineyards and within a decade produced the first New Zealand wine. We visited four New Zealand wineries on our tour and tasted 30 different wines. Three wineries encouraged us to sip and enjoy their various vintages and varieties. However at the Hatton Estate Winery they taught us a true wine taster spits rather than sips. They poured us generous glasses of wine. After swirling the wine around to release the aroma we were instructed to stick our noses fully into our goblet and sniff heartily to inhale the scent. Next we were to gulp all the wine in our glass and swish it around in our mouth for up to a minute, being sure it reached every corner and crevice and taste bud. Then we were to spit the wine out into the huge buckets provided. Dan Baker owned the Maona Park Winery. He had studied oenology (the art of winemaking) in Canada. Dan asked us to describe the taste of one of the wines he poured for us. Interestingly, we all tasted different things. A woman from England said it tasted like rose petals. A man from Auckland compared the wine to Turkish Delight candy. My husband thought it tasted like tomatoes. A woman from Finland said it reminded her of asparagus. Dan said we all have certain taste memories stored in our brain. Different wines trigger different memories for us. That’s why four people drinking the same wine each taste something different. Other posts about New Zealand….. Yesterday I was reminded of one of my grandfather’s puns. 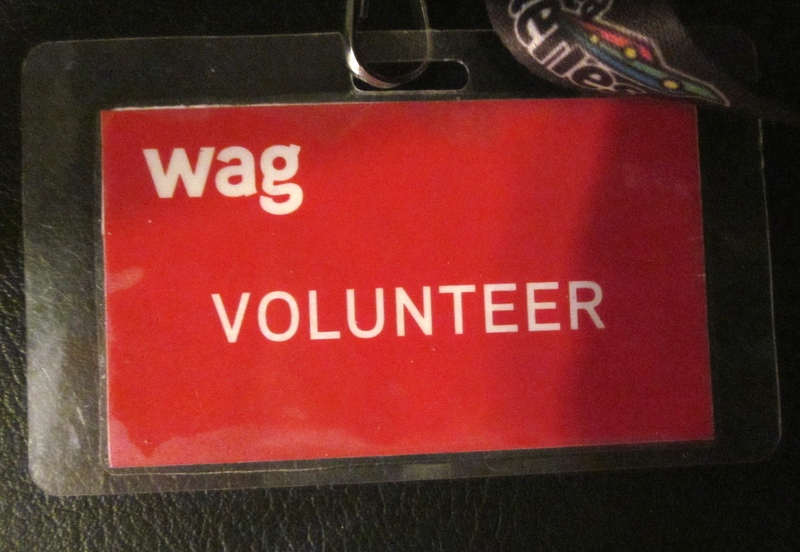 “My feet are killing me,” said a customer while I was working the cash register at the Thrift Shop where I volunteer. The woman asked if she could trade in the new ill fitting shoes she’d purchased the day before at big box store for a much more comfortable used pair on our shelves. After she left my fellow clerks and I chatted about the damage poor fitting shoes can do to a person’s feet. 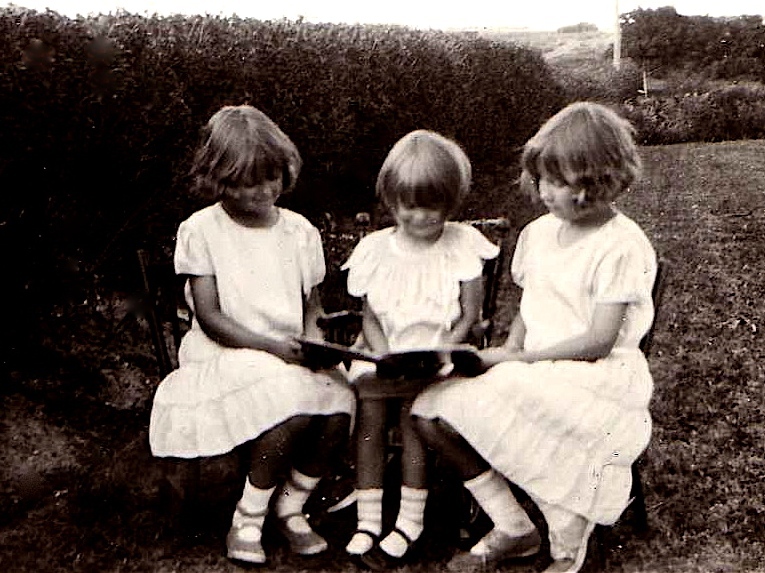 My mom ( on the left) reading with her sisters around 1933. Check out their nice shoes. It reminded me of something my mother once told me. Her father always insisted on his children having shoes that fit well. My grandmother’s feet had been damaged by poor fitting shoes and Grandpa didn’t want that to happen to his kids. He spared no expense to be sure his four children had shoes that fit properly. 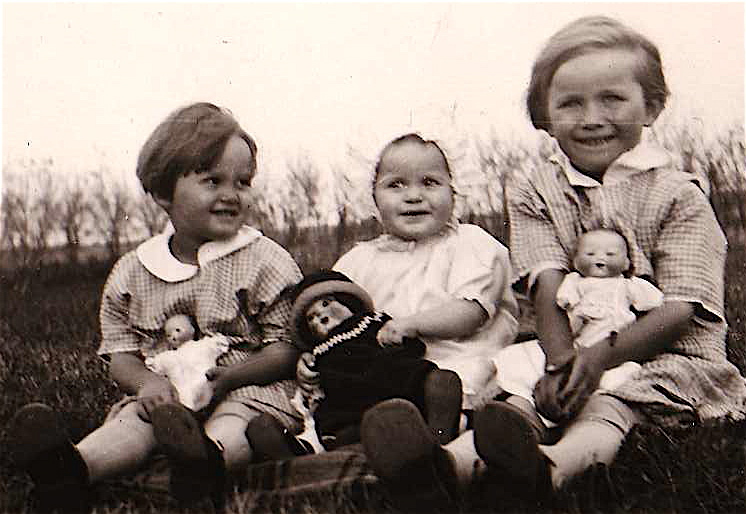 Here is Mom (again on the left) and her sisters with their dolls, probably around 1929. Look at those nice shoes they are wearing. He used to joke and say he was going to make sure his children had a good under standing. Get it? Other posts about my mother’s childhood……. 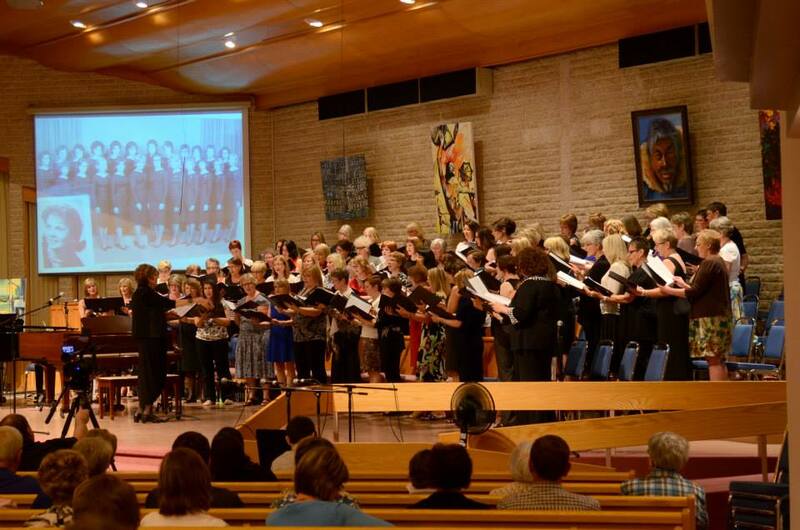 Last weekend thanks to Cindy Rempel Patrick, the Steinbach Arts Council, and Golden West Radio, I was able to enjoy a reunion concert and brunch for the Treble Teens, a singing group that put Steinbach on the map for a number of decades. 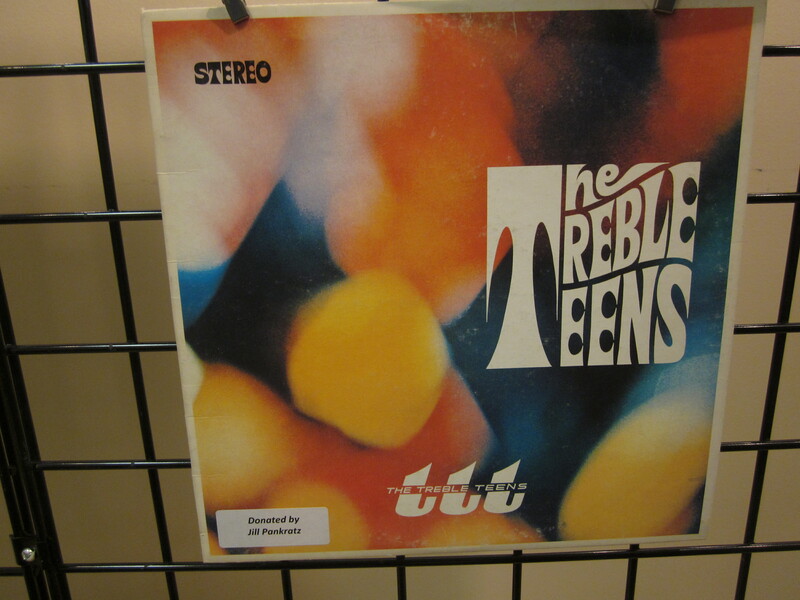 I was in the Treble Teens from 1969-1971. 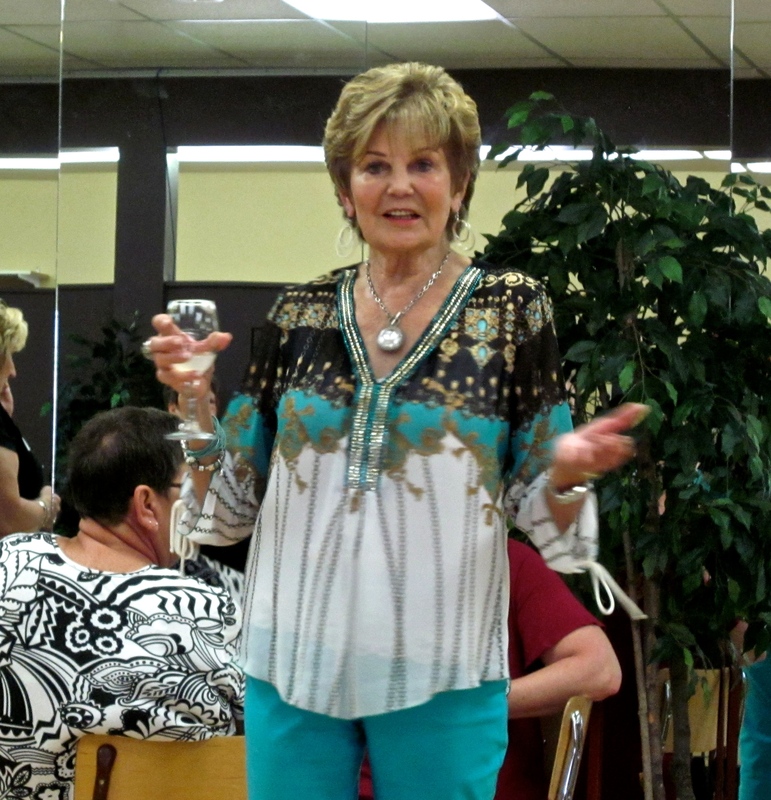 Like many women in the choir I learned valuable lessons about responsibility and teamwork from my experience. 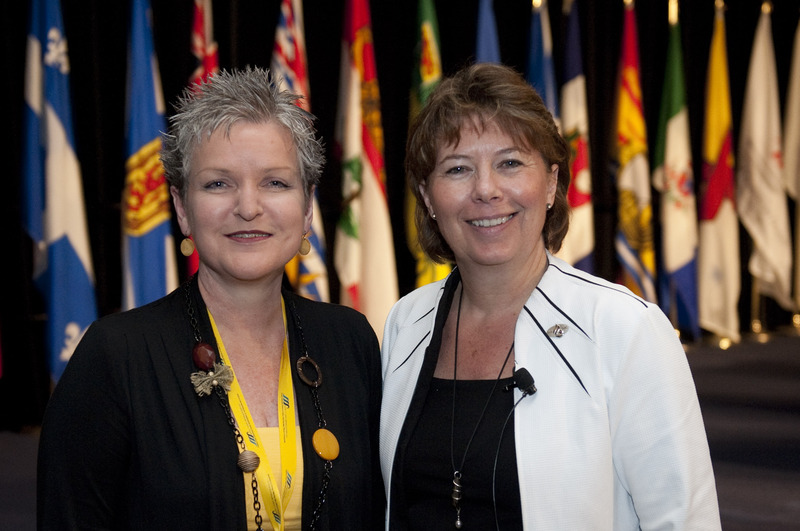 Four years ago I had the privilege of writing a news story about Jocelyn Reimer Kent, a former Treble Teen, who was a University of British Columbia adjunct professor and the president of the Canadian Council of Cardiovascular Nurses. Jocelyn had developed an internationally recognized protocol for treating cardiac surgery patients. 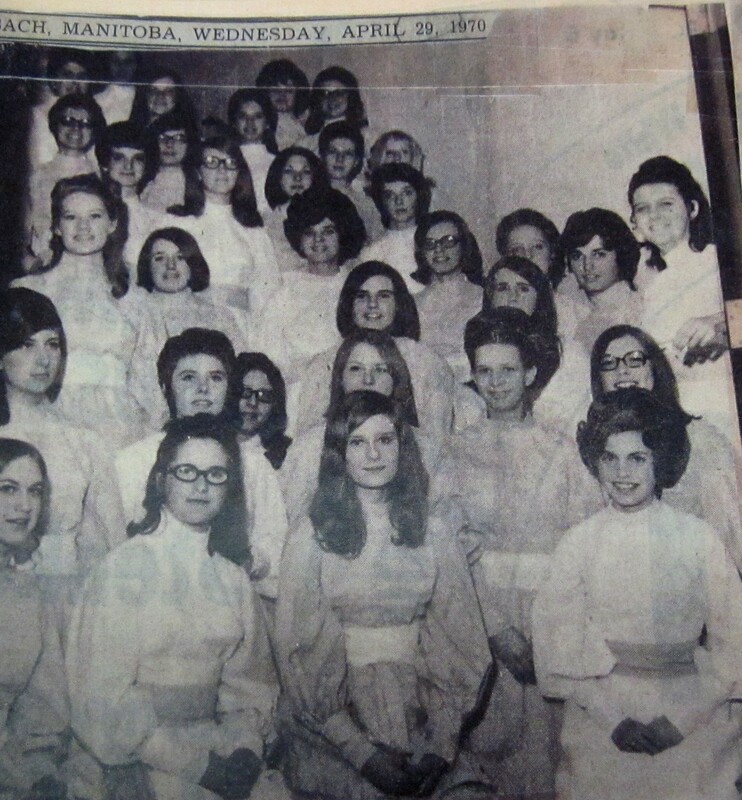 Jocelyn Reimer is third from right in the first row in this newspaper photo advertising the May 1970 spring concert of the Treble Teens. I’m at the far left of the last row. During our interview Jocelyn expressed appreciation for the lessons she’d learned while performing with the Treble Teens. She said director Shirley Penner helped her cultivate the confident stage presence she had needed to present her innovative ideas to audiences from across Canada and around the world. Jocelyn’s story is one echoed by many of the Treble Teens I spoke with during our reunion weekend. Besides learning music skills their participation in the choir helped develop traits of leadership, loyalty and poise that served them well in life. 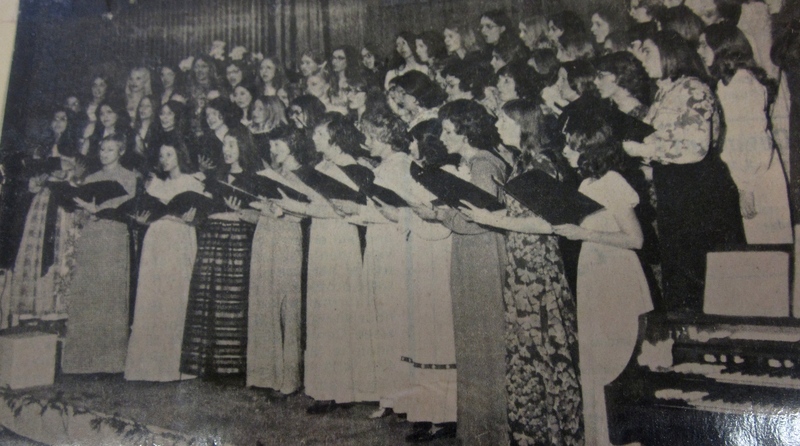 Current and alumni Treble Teens join forces to perform a number together at the 1971 spring concert- I’m at the far end left in the second row wearing my colourful highschool graduation dress with the big bow. It was a treat to browse through the memorabilia on display at the Cultural Arts Centre during our Saturday morning brunch. Looking at photos of the choir from my era I was surprised I was still able to name almost all forty singers with whom I’d performed. I was delighted to see a copy of the record we’d made and found I could still recall the words and music to most of the songs we’d recorded like The Sleigh, Moody Manitoba Morning, Little David Play on Your Harp, Raindrops Keep Falling on My Head and Last Night I Had the Strangest Dream. 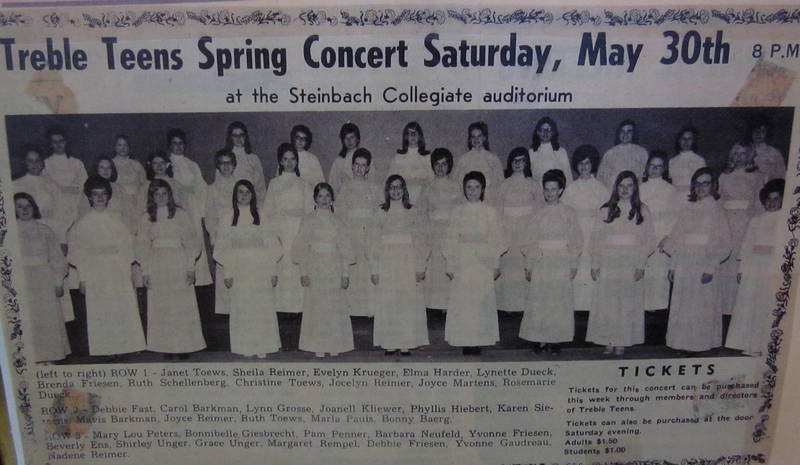 Looking through scrapbook pages I was impressed by all the things our choir had done- participating in a multi-cultural show at the Centennial Concert Hall, recording radio and television programs, singing with the Winnipeg Symphony and traveling to other provinces to perform. It was interesting to see how times had changed since the 1970’s. 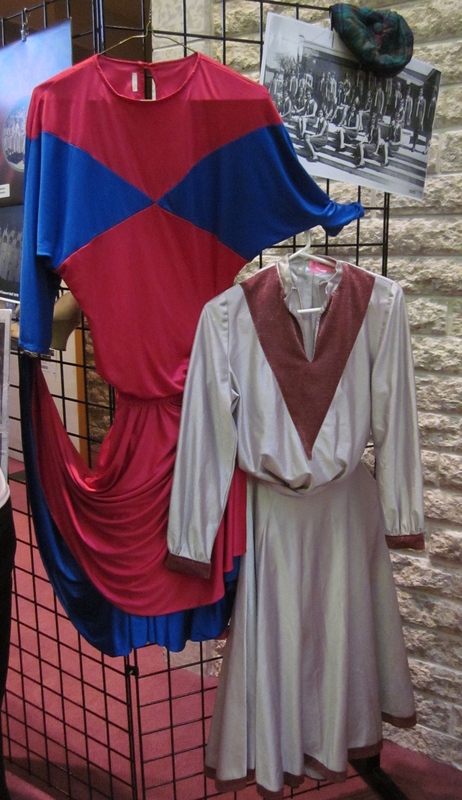 I noted in newspaper articles about the Treble Teens, Shirley Penner, the group’s director and founder, was referred to by her husband’s first name rather than her own, and that the songs we sang frequently used words like brotherhood and man even though our choir was exclusively female. I got teary at the concert when Arts Council President Frances Funk mentioned parent support. My parents paid for my participation in the Treble Teens and my voice lessons. They drove me to practices, came to my concerts and helped with fundraising. I was sad my Mom, who died a year ago couldn’t be at the reunion concert. She’d have loved it. I bumped into my Carillon editor Grant Burr at the concert and when I told him I’d be writing a column about the reunion for this week’s paper he suggested, perhaps in jest, that I reveal the ‘untold story’ of the Treble Teens. I haven’t done that, because despite the inevitable behind the scenes politics that exist in any organization, the experience of singing in Treble Teens was overwhelmingly positive. But I will leave you with one ‘inside scoop.’ Quite a number of former Treble Teens confessed that like me, they had their mouths open but weren’t really singing on those high notes at the concert on Friday night. After all many of us are in our sixties and at least in my case, the only singing I’ve been doing of late is with my grandson. My husband and I were standing in line on Sunday evening to hear Winnipeg band Royal Canoe. The show was a make-up performance for an outdoor event that had been cancelled the day before due to pouring rain. We started chatting with the young couple just behind us. We asked if they’d been at the rained out event. They had. My husband remarked that seeing all those music fans getting soaked in the rain had reminded him of Woodstock. The couple nodded and smiled politely. “You’ve never heard of Woodstock?” my husband asked. They hadn’t. “Do you know who Joe Cocker is?” They shook their heads. “Joan Baez?” I asked. “Crosby, Stills and Nash?” my husband wondered. They shook their heads. My husband told them briefly about Woodstock, the famous 1969 weekend music festival where hundreds of thousands of attendees got soaked in the rain. The young people listened politely and then went back to checking their phones. 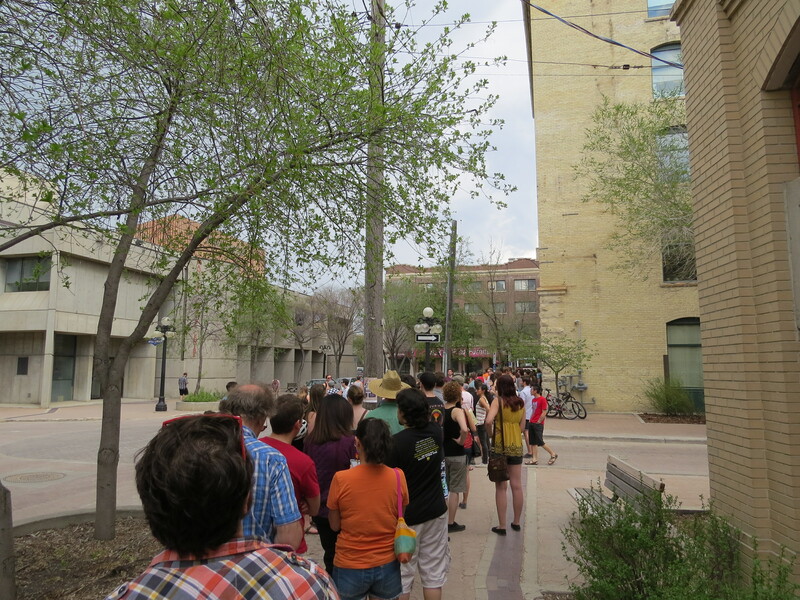 “Honey we’re old,” I whispered as the line began to move towards the Union Sound Hall entrance. Other posts about being old……. The doors slid open and as soon as I stepped into the elevator I knew that the lone woman sharing the ride with me was someone whose face I had seen before. But who was she? I was at the Winnipeg Art Gallery last Friday to give a tour to a group of high school students. I’d gone upstairs to stow my purse safely and was headed back to the foyer to welcome my tour group. “Susan Thompson,” she said holding out her hand. That’s why I’d recognized her I thought. “You were the mayor of Winnipeg,” I said as I shook her hand. 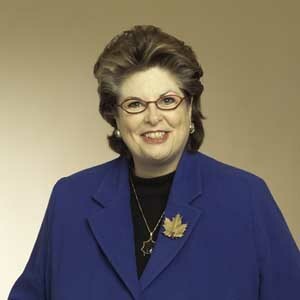 I figured out later Susan must have been at the art gallery for the Culture Days Congress that was being held on site. How nice of her to be so personable and thank me for being a volunteer. It made my day. Last Sunday I heard a sermon about sorting weeds. It was based on a parable Jesus told in Matthew 13 . It goes something like this. Jesus explained that the field was the world and the weeds and wheat represented evil and good people. And when the time was right God would sort them out. The pastor I heard reflect on this parable said it teaches us three things. 1) Judging people isn’t up to us but up to God. Usually when the church has tried to do the judging they have messed up big time. 2) We often judge people too quickly. Patience is required. The servants wanted to sort out the weeds and wheat right away but the master said wait, give them a chance to grow first. 3) God’s judgements may surprise us because God judges differently than people do. We tend to think judgement is a way for people to get what they deserve. God says all people deserve grace and love. This is what I took away. Accept people. Remember people can change. Sometimes we judge people because we are unaware of their whole story. We will be happier if we aren’t judgemental of others. We’re all a mixture of good and bad. There aren’t easy categories for sorting people. Is It Good to Be Lazy? 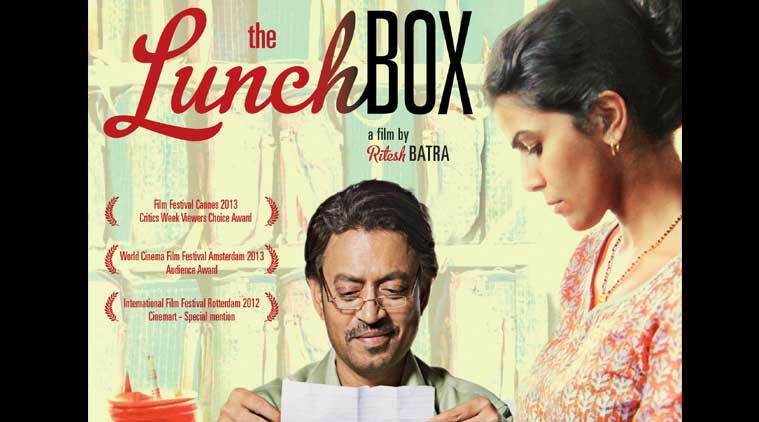 I love a good romance and so the movie The Lunchbox was just my cup of tea. It’s an exquisite love story set in Mumbai. You get a real flavor for modern city life in India along with a tender tale and a lesson about the value of relationships. Saajan is a lonely widowed accountant and Illa is an unhappy wife whose husband is cheating on her. One fascinating thing about the movie was learning about the dabbawallas lunch delivery system founded in 1880. 5000 workers called dabbawallas pick up hot lunches in tins from people’s homes or from a restaurant, and deliver them to office employees throughout Mumbai. According to an article by Meena Kadri only one mistake is made in every six million deliveries. This movie is about one such mistake. Instead of the lunches Illa makes arriving at her husband’s office they land up on Saajan’s desk and one thing leads to another. They begin exchanging notes in the lunch box and fall in love by letter. But will they actually ever meet in person? That’s the question at the heart of this movie. Although I enjoyed watching Illa and Sajjan’s romance develop my favorite part of the movie was the way both Saajan and Illa are supported, inspired and renewed by a strong friendship. There is an older woman we never see who lives just above Illa’s apartment. Illa calls her ‘auntie’ and she is a humorous wise character constantly shouting down advice, warnings, recipes and observations to Illa. Illa’s mother has troubles of her own to deal with and this ‘auntie’ is a true friend and second mother to Illa. An Arab young man named Shaikh is sent to Sajaan to be his trainee at work. Although Sajaan doesn’t like Shaikh at first they eventually come to be friends and Shaikh, who is an orphan, invites Sajaan to be the best man at his wedding. Shaikh helps Sajaan realize how lonely his life has become since his wife’s death and how reaching out to other people might change that. We see this change demonstrated in Sajaan as he becomes less gruff and more interactive with the children in his neighborhood as well. I wanted a more conclusive ending to this movie but my husband chided me saying the last scenes were fairly bursting with potential and I should be satisfied.